MDX trim, Aspen White Pearl exterior and Parchment interior. CARFAX 1-Owner. Moonroof, Third Row Seat, Heated Leather Seats, Back-Up Camera, Premium Sound System, Rear Air, Aluminum Wheels, All Wheel Drive, Power Liftgate. READ MORE! Leather Seats, Third Row Seat, Sunroof, All Wheel Drive, Power Liftgate, Rear Air, Heated Driver Seat, Back-Up Camera, Premium Sound System, Satellite Radio, iPod/MP3 Input, Bluetooth, Multi-CD Changer, Aluminum Wheels, Dual Zone A/C. Rear Spoiler, MP3 Player, Privacy Glass, Keyless Entry, Remote Trunk Release. 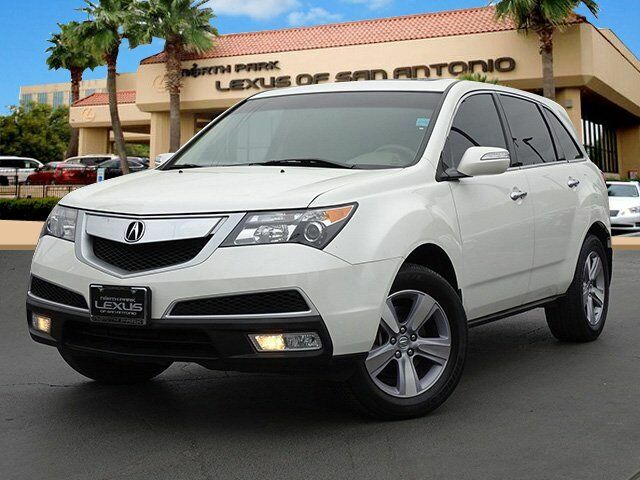 Acura MDX with Aspen White Pearl exterior and Parchment interior features a V6 Cylinder Engine with 300 HP at 6300 RPM*. Child Safety Locks, Electronic Stability Control, Brake Assist, 4-Wheel ABS, Tire Pressure Monitoring System, 4-Wheel Disc Brakes "Capable handling; user-friendly high-tech features; finely crafted interior; relatively roomy third-row seat." -Edmunds.com.